Mx4. Maxim Guns, a 4-part article, Engineering 1898, February 11, February 25, March 18, April 1st 1898. Mx7. 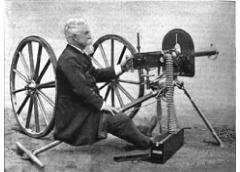 Improvements in and relating to Machine or Battery Guns and other Fire-arms, Hiram S Maxim, UK Patent No. 1307 29 Jan 1885. Mx8. Improvements in Machine and other Guns, Hiram S maxim, UK Patent No. 8281, 8 July 1885.